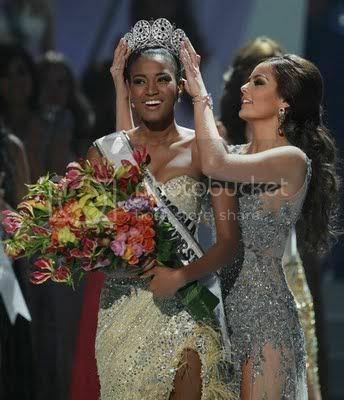 The 1st ever winner from Angola, the 4th African and the 60th Miss Universe titleholder, Leila Lopes won the prestigious crown Miss Universe 2011 during a gala held on September 12 at the Credit Card Hall in Sao Paulo, Brazil, where she beat 88 other gorgeous candidates. Receiving her crown and sash from the outgoing Miss Universe 2010, Ximena Navarette. The pageant last almost 2 hours and was hosted by Andy Cohen and Natalie Morales. The venue was filled with international audience around the globe and local Brazilian fans cheered for their favorite candidates. Miss Ukraine, Olesya Stefanko as the 1st run-up. The hometown girl, Miss Brazil, Priscila Machado ended up as the 2nd run-up, which many believed she has made too far. Surprisingly low placement, Miss Philippines, Shamcey Supsup is the 3rd run-up. And finally, Miss China, Luo Zilin as the 4th run-up.